✿ SPECIAL DESIGN: 2 expasion zippers at the side of this Duffle Bag. The volume is 39L when you pull the Expasion zippers, while open them, the space can be extended up to 5cm, the capacity comes to 44L. ✿ DIMENSIONS: 20.8*9.8*11.8 IN/ 53*25*30 CM (L*W*H), Weight: 1.3KG/ 2.8 LB, Capacity: 39L. 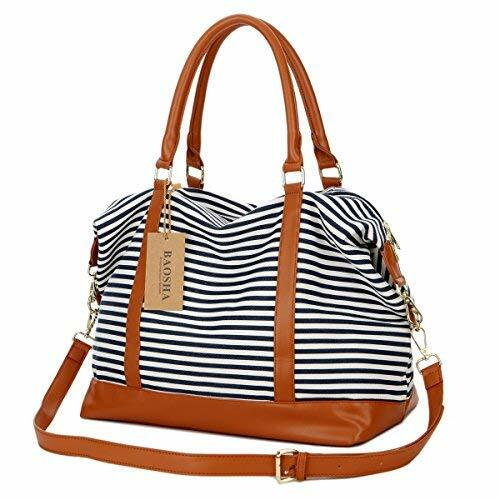 This bag has a vintage looking with durable cotton canvas and it can fit about 5-6 days of clothes easily. ✿ GOOD QUALITY: 16OZ soft canvas and it won't rip or tear when you put a lot inside of the tote. All-match Europe style. 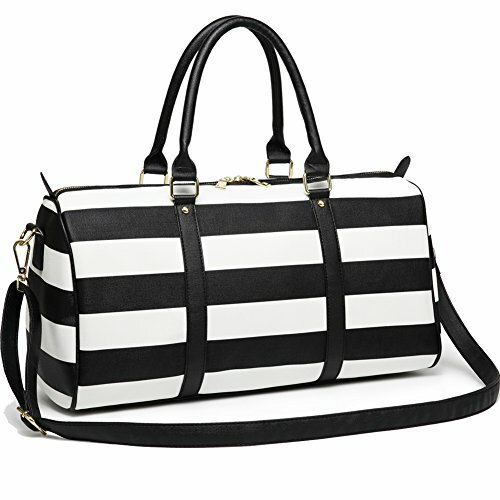 It is a fashionable leisure travel Duffel Holdall. Classical, Awesome and Stylish! ✿ MULTI-POCKET: Features a classic shape with several pockets for storage and organization. 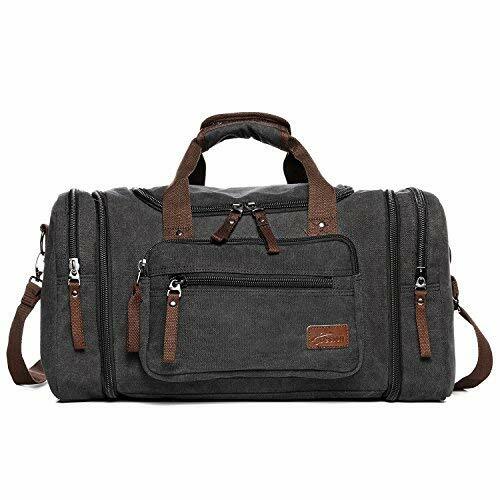 This travel holdall has 1* roomy main compartment, 1* front zipper pockets to hold small accessories, 1* internal security zippered pocket for valuable items and 2*side zipper pockets for shoes or umbrella. LIGHTWEIGHT and ROOMY(39 Liters). A true space saver with zipper closure for safety. ✿SHOULDER STRAP: Adjustable shoulder straps for comfortable carrying. It's convenient to hand out, go hiking, traveling, sport gym, go to school and so on. 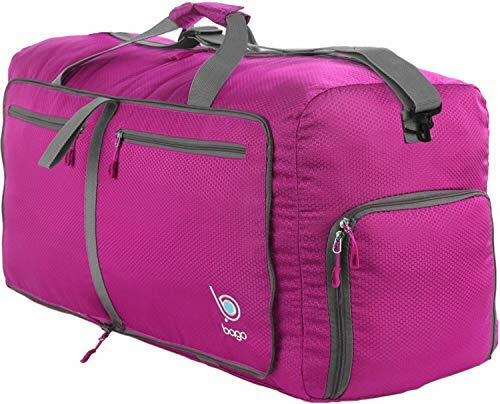 EVERYONE NEEDS A LARGE TRAVEL DUFFEL BAG: Measures 11x15x27 inches with 80 Liters capacity and weighs 1.5 pounds. Multipurpose: for travel, sports gear, shopping, and organizing. Folds up compact to: 11.8" x 12.6" (30 x 32 cm). Take it along as an extra "Just in Case" bag. Pick your favorite color. DURABLE AND CONVENIENT: Water and odor proof outer compartment. Reliable zippers with pull strings. Honeycomb waterproof RipStop fabric resists wear and tear. A reliable travel bag or gym bag designed to last for long use. 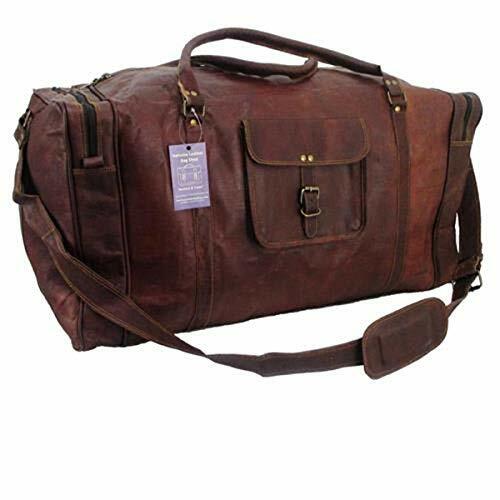 These are sturdy duffle bags, travel bags for men and travel bags for women. 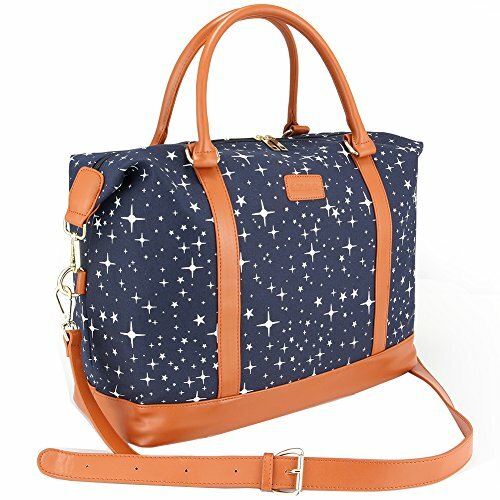 A MULTI-PURPOSE TRAVEL NECESSITY: Use as main luggage, a shopping bag, overnight or weekender bag. Weighs 75% less than most luggage! While traveling, simply unfold at the airport to carry gifts/souvenirs, laundry, or transfer items from a damaged suitcase to avoid baggage charges. Prevent stress! SPACE LIKE A SUITCASE BUT LESS BULK: Has an accessible shoe compartment for separating articles from main bag. Great for sport items used for training, games, and the gym. Haul the kid's toys and playpens. Store gear at home, in the garage, or in your car. Collapsible for easy storing or carrying. BAGO TRAVEL BAGS QUALITY AND PEACE OF MIND: We use top quality materials and craftsmanship, and responsible manufacturing for our duffle bags. We stand behind our products and service. Our customer support team is ready to help and ensure your satisfaction. 100% WARRANTY AND MONEY BACK GUARANTEE! 【Spacious】Dimension: 17.3L x 11.8H x 7.8W inches; The weekend bag women perfect for traveling, work, weekend trip, gym, shopping, beach or daily use. Perfect gift choice. 【Back Trolley Sleeve&PU Leather Shoulder Strap,Hand Free】 Back trolley sleeve that slips over rolling wheeled luggage handle;Carry-on bag with an adjustable PU Leather shoulder strap for satchel or cross body style,free your hands. 【Large Capacity】 1 main zippered compartment for some clothes, water bottles and toiletries;1 inner zippered pocket;2 slip pockets for wallet, phone, keys and etc.